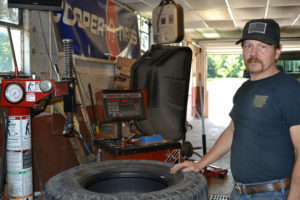 A breath of fresh air has blown in to Emmitsburg’s Quality Tire and Auto, where new owner Ron Walter has continued to push consistency in a business that has been running for over forty years. Former owner Bob Mort left big shoes to fill, but Ron and his wife, Maureen, have hit the ground running after taking over ownership in June 2018. In a small town, it can be difficult to find a knowledgeable mechanic that people trust who will offer them good service and a fair deal. Choosing the right auto mechanic can often be a life-long professional relationship. Walter has managed to calm speculation that Quality Tire might close down, offering locals who have been serviced at the company prior to his arrival the quality they have come to expect. Walter spent the past thirty-five years as a mechanic, honing his skills that ultimately led him to take the reins as owner of his own business. But, even though Walter boasts a lifetime of experience, the transition to becoming a first-time business owner can be tough to adjust to without a solid support system. Fortunately for Ron and Maureen, who are Thurmont residents, business has been steady enough to grease the wheels heading into the family’s new role. “It’s been so busy, we haven’t really had a lot of time to think about it,” said Walter. As the two begin to settle into being first-time business owners, and as customers continue lining up for all of their tire services, the move has inspired a bit of confidence about the future of Quality Tire and Auto. “I was a little worried about the transition, but everything went really smoothly, and Ron has picked up on everything so well,” said Maureen Walter. Despite the whirlwind of changes over the past two months, all signs point to Quality Tire and Auto keeping the local tire business thriving for years to come. Call Quality Tire for more information at 301-447-2909 or visit the station at 17650 Creamery Road in Emmitsburg. Pictured is Ron Walter, new owner of Quality Tire and Auto in Emmitsburg.